Most packing, if properly maintained during the pump’s operation, should last around 2 to 3 years. When it is time to replace it, how much of a project it is depends on the type of fire pump you have. A horizontal (or vertical) split-case design, where packing exists on either side of the pump impeller, is more challenging because it can be difficult removing the old packing without removing the top half of the pump casing. Some people just try to pull out the packing without removing the pump casing, but we do not advise doing that. Not only can you possibly miss some remaining packing in the pump interior, but placing new packing into the pump will be equally challenging. The proper job requires safe and clean access to all pump packing rings, and for a split-case pump design, that often means removing the top half of the pump casing. This is challenging work, so be sure to consult the professionals to ensure that the pump components are properly installed, and the the pump is reassembled correctly. If you have a vertical inline pump, the packing is usually very easy to reach without disassembling the pump. Once all the old packing has been completely removed, you can inspect all surfaces for pitting, scratches or other signs of wear along the shaft sleeves. Severely scored or scratched sleeves are often problematic, as they lessen the effectiveness of new packing material, as water has an easy escape route through the scratches surfaces along the sleeve. If nothing is found — or you’ve taken care of these issues by resurfacing or replacing worn out parts — make note of all key dimensions. Some pumps have what is called a lantern ring – which is a Teflon or bronze device located within the packing that is meant to receive pressurized water from the fire pump so that air cannot escape back through the packing and cause the fire pump to fail. Many people think that lantern rings are there for cooling, but that is actually a secondary purpose. In fact, the presence of these lantern rings are often the reason why it is difficult to remove all of the packing rings without removing the pump casing on a split-case pump. The lantern rings tend to block out access from along the shaft. Once you’ve measured everything, you can cut your new packing into individual rings so they form one solid piece (no gaps!) when they’re inserted into the stuffing box. They should all sit flush on the bottom of your stuffing box before the next one is added. Don’t forget to stagger your rings by 90 degrees so the seams are offset. Now you’re ready for adjusting the packing glands. We’ve previously outlined how easy it is to adjust your fire pump packing glands, so be sure to check out that blog post if you need specifics. 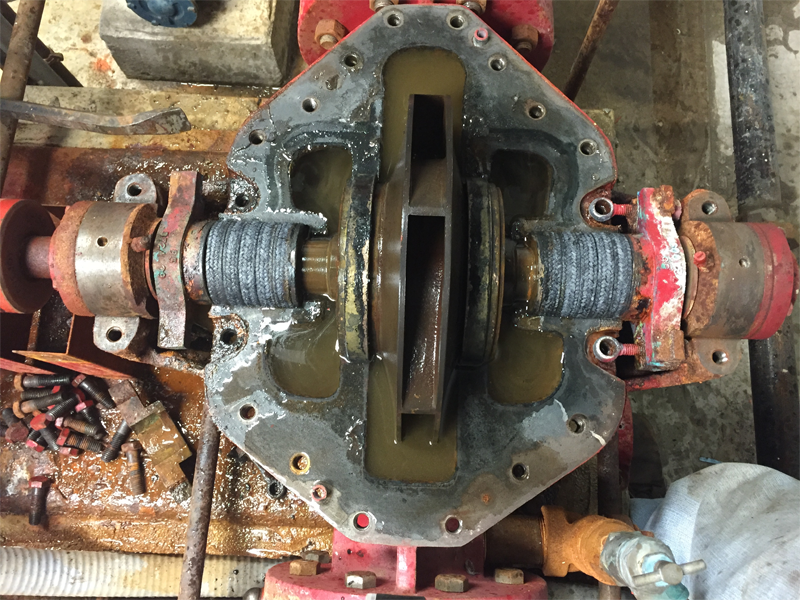 Remember, you don’t want to fully eliminate leakage, as it is required for proper lubrication and cooling, and also helps to lengthen the service life of your pump. Overtightening packing is the most common cause of failure. You should typically have one drip per second continually, even with the pump not operating. New packing requires a “break in” period of at least four hours of pump operation. It is not uncommon for packing to leak more than you would like at first. Packing adjustment will be more frequent at first. But as the pump and packing start to set in, you can expect a couple years of consistent and reliable service. 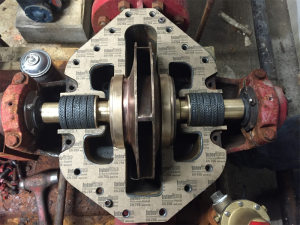 If you have any questions about replacing fire pump packing, or would prefer we perform the service for you, simply pick up the phone and call us at 302-652-4722. Specializing in fire pump sales and service in Delaware, Pennsylvania, New Jersey, Maryland and beyond, the team at Steven Brown & Associates has the extensive knowledge and experience to help you get your fire pump back into tip-top shape.